I still recall the weight of winter blankets keeping me warm. I’d pull them up to my chin, imagining – if I just waited long enough – I’d hear sleigh bells. But try as I might, I couldn’t keep my eyes open. I’d drift off to sleep then awake the next morning to a welcoming Christmas bounty. While there were always nice gifts and stockings filled to the brim for my four siblings and me, in my little-girl heart I couldn’t help but be disappointed. I’d gotten the prize, but had missed the magic. I couldn’t have known how wrong I was. It took growing up to understand the far reach of magic. All of us experience magical moments throughout our lives: some of them great, others small. But there’s something extra special about the magic that occurs at Christmas. When we first plug in our tree and it shimmers with colorful lights, I gasp with wonder. As we hang stockings from the mantel and I think of our beautiful blended family, I feel a happy lift in my soul. And when my husband takes me in his arms under the mistletoe, I still glimpse magic in his eyes. This December twenty-fourth, will you be listening for sleigh bells? I know I will. What’s more, I trust I’ll hear them. 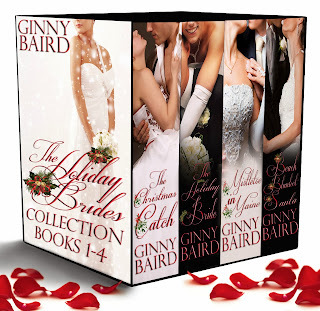 Ginny Baird is the author of novellas in the Holiday Brides Series and numerous other titles. She’s a big believer in magic and the power of what’s in our hearts. You can visit Ginny’s at her website or connect with her on Facebook and Twitter. Book 5 in her Holiday Brides Series, Baby Be Mine, is now at Amazon. Ginny, you're right. It is so easy to forget the magic of Christmas in the hustle and bustle of shopping and preparing. We all have to do so much to get ready that the holiday period can become a chore. Lovely post that made me stop and think! Thanks, Helen. I appreciate it. Happy holidays! I agree, there is something magic about Christmas and especially Christmas day itself. It just "feels" different, almost magical!